Have you ever been in a season where you just felt alone? You may have four kids, a thriving marriage, but when it comes to female friendships, something is just holding you back from experiencing what your heart desires! Maybe you have a lot of friends, but deep down inside you are spread so thin among them all, that you don’t have the time required to truly get to know someone and develop the kind of kindred sister friendship your heart yearns for. Maybe you have always had a hard time getting along with other women. Even as a young girl, you got a long way better with the boys who didn’t gossip, judge you, or turn on you at the next recess. We have all had them. Those friendships where we want the conversations to go deeper, but we just don’t know how. What is it? And how can we change it? Getting real can be scary at first. But the fruit is so worth it. You see, I was that girl in school who wanted to be popular. I believed a lie that popularity was developed based upon who was nicest and had the most friends. Obviously, my naivety had to have gotten me hurt. And it did. But through that, I learned that a few close friends that can love you through it all– the weird Aqua Net Bangs, New Kids on the Block groupie phase and all– they were the ones worth hanging onto. Then came high school, when Jesus became real to me. And all of a sudden there was a growing division in most of my friendships. A division because I felt like I couldn’t share who I was becoming without rejection. So slowly, I began just growing up, which meant growing out of a lot of friendships too. I wasn’t mature enough to know how to be ME with those who weren’t like me. I felt alone, and abnormal. Then years went on, I went to college, got married and to my surprise female friendships didn’t seem to get any easier. In fact, they were kind of more complicated. Life decisions, parenting decisions, all of it, all of a sudden could impact the depth and length of a friendship. Scary. Thankfully, God intervened and put some amazing women in my life 15 years ago. Those friends, though we are scattered are still dear sisters to me. And I value them, not because of their lifestyle choices, but because our friendships were founded on Jesus. Those friendships taught me how to dig deep, how to be real, how to pursue growth while in friendship together. I don’t feel judged for how many kids we have, I feel supported. And whatever education path we choose for our children, I know it will be respected. But it hasn’t all been roses. There have also been those other friendships. The ones that no matter how hard you try, they just don’t go deep. You still feel misunderstood and unable to be fully you. So what is the markable difference between the two? The ability to be real, without judgment, without comparing, and without competition. How do you transform or find these friendships? You can’t do it alone. But God can help you as you step out in faith and trust, being willing to be vulnerable. What do you have planned for this summer? What books are on your reading list? Or are you planning to rest? If you have ever been a part of a women’s Bible study or mom’s group at your church, you have noticed by now that most take a break for the summer. So, what is your plan for fellowship during these months when you are taking a break? Do you still meet with your sisters for fellowship? I want to encourage you with a little challenge. May I? Reflect for a moment on your friendships. There is always room for growth in every relationship, right?! Take a moment and ask the Lord to reveal to you how He could be more glorified in your relationships. Then ask Him to reveal to you opportunities where you could be a better friend. And if you want a challenge to grow your other relationships READ THIS. Meet weekly or monthly to pray together. You could choose to pray openly, led by the Holy Spirit each week, or you could choose a theme for a week or a month such as praying for your marriages, or praying for your sons or daughters together. The point is to pursue a friendship that has a healthy quantity of prayer. When you get together to share of struggles or blessings, pray together. When you get together for a meal, pray together and thank God for the fellowship you are about to experience because it is precious. And then take it to the next level and ask your friend if they would be comfortable with meeting regularly to pray! There is much truth and wisdom in this counsel. But we also need to remember that just because someone goes to church or says they are a Christ follower, it doesn’t mean that they are or that they have the same expectations of friendship that you have or desire. And this summer, while you are not in regular study with your community, you are going to need to try harder, be intentional about gathering for fellowship. For conversation that is going to inspire zeal and a pursuit of holiness deep in your soul! We were made for fellowship and communion with God, with each other, and together with God. Invest in each other’s marriages by swapping date nights, and take that time to pray for the couple while they are out on their date! Do a study together. Some of the richest times I have had with my friends are when we have studied a book or the Bible together. And I have just the study for you! 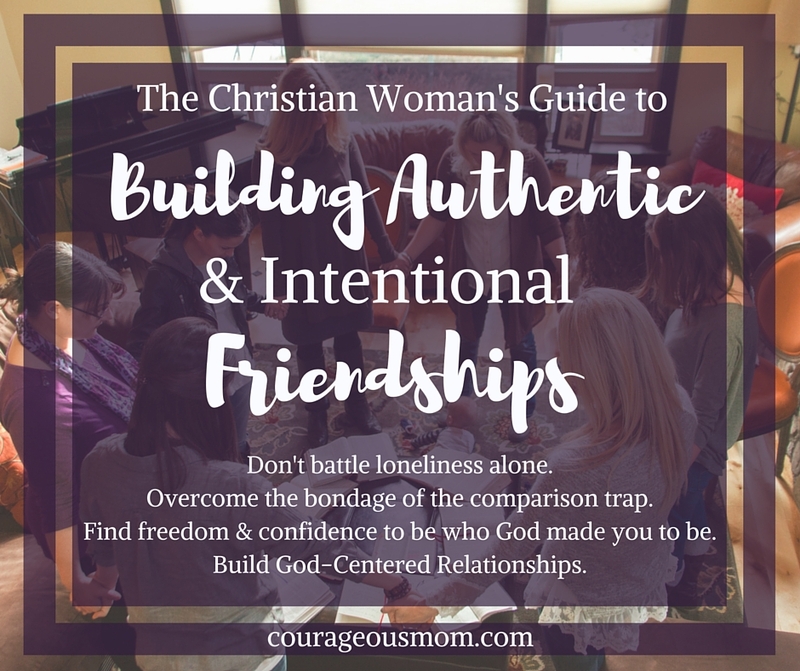 Did you know that you can go through The Christian Woman’s Guide to Building Authentic & Intentional Friendships as a group? I pray that as you are getting together for park play dates, coffee gatherings, and ladies’ night out, that you take a moment to pray before your sweet times of fellowship. I pray for God to be glorified and for your time together to be edifying. If you are interested in finding out more about the new online bible study we have an open Facebook Group here with a ton of info, or you can find out more on the landing page here: http://courageousmomacademy.com/courses/authentic-friendships/!